10.28.2014, Uncategorized, by Jack W Perry. Children’s books have changed a lot over the years. I guess so has so much of the media aimed at kids. 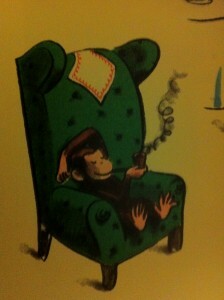 I was reading a classic, CURIOUS GEORGE to my two-year old last night, I came across this one picture of George relaxing after a hard day smoking a pipe. Ok, this was written during the MAD MEN era. But I still found it rather funny, Then I started thinking of other cartoons that were from my childhood that were doing inappropriate things.